Understanding the European Union 5 Edition This best-selling textbook provides a broad-ranging but concise introduction to the EU, covering all major aspects of European integration. The revised and updated new edition takes full acount of the Lisbon Treaty and the consequences for Europe of the global economic crisis. With 27 member states and nearly half a billion residents, the European Union is a major actor on the world stage. It has changed the way Europeans live, as well as the way the rest of the world relates to Europe. Yet it remains widely misunderstood and a source of puzzlement to many: • How does the EU work, and what impact has it had on the lives of Europeans? • What difference has it made to the meaning of 'Europe'?• How has it changed the role of Europe in the world? 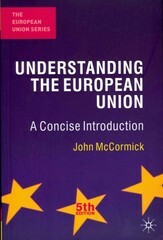 Written for anyone who needs a short and clear introduction to the EU, John McCormick's best-selling text provides a concise yet broad-ranging survey of how the EU works. It covers the history and institutions of the EU; the underlying principles of European integration; the impact of the EU on its member states and citizens; and the evolution and effect of EU policies. Fully revised, the new fifth edition brings the European story up to date with assessments of the Lisbon Treaty, the fallout from the global economic crisis, and the eurozone crises of 2010–2011.